GROWTH 100% BIO is a liquid nitrogenous organic fertilizer for the treatment and prevention of ferric chlorosis, suitable for the entire vegetative phase of plants. Mixture of organic nitrogenous fertilizers with iron (Fe) for horticultural use permitted in organic farming. - Rapid increase in plant growth. - Greener and lush leafy plant. 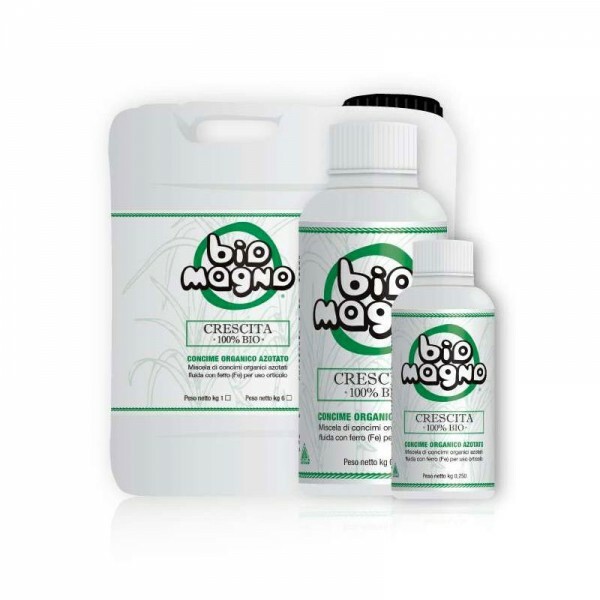 - Prevents and cares for ferric chlorosis and soil fatigue. - Induced resistance to stress and pathogens. Dosages: 0.5 ml - 1 ml liter of water for the whole period of vegetative development as fertilization card. Application: by radical way; by leaf. Composition: Nitrogen (N) total 5%, Nitrogen (N) organic 5%, organic carbon (C) 16%, Iron (Fe) soluble in water 0.06%, Iron (Fe) chelated with EDDHSA 0, 06%. Chelating agent: EDDHSA. PH range which guarantees a good stability of the chelated fraction: 3-10. Organic fertilizers or soil improvers / for at least 21 days after application it is forbidden to feed farm animals with herbaceous plants taken through pasture or administered after being harvested. Raw materials: fluid body with maximum concentration in mg / kg of dry substance of Cr ˅ᴵ = 0, fluid borenge from beet molasses not extracted with ammonia salts, fluid blood, iron chelate (EDDHSA). Product obtained solely from organic nitrogen fertilizers "permitted in organic farming"
Any swelling or shrinking of the container is due to the quality of the product, as it contains an active organic preparation. Once diluted, use within 24 hours.